What qualifications should a disciple possess before accepting a guru? Śraddha – sincere, strong appreciation for what the guru possesses and sincere, strong desire to attain the same. What are the primary qualifications of the guru? 1. Clear knowledge and realized faith in the philosophy, practice, and ultimate result of Krishna-bhakti. 2. The ability to explain it thoroughly and answer all questions on that subject. Should I prefer a guru who answers questions but doesn’t seem very transcendental – or a guru who seems very transcendental but doesn’t answer questions very well? Find a guru with transcendental realization and the ability to explain it clearly by answering all questions. What is the Qualification of a Dīkṣa-guru? 1. Dīkṣa guru grants official acceptance into the linage, so s/he must embody what the lineage values. 2. Conventionally, the dīkṣā guru is the most culturally senior person in the lineage or branch. What is more important, finding a dīkṣā guru or finding a śikṣā guru? Finding good instructors is more important because by finding instructors, the initiator soon emerges. Śikṣā-gurus lead to Dīkṣā-gurus, so they are more primary and important. The function of instruction (śikṣā) remains more important than the function of initiation (dīkṣā). To make it clear, getting accepted into a university is important, but going to classes and learning is even more important. The two are related and inseparable, but of the two śikṣā is primary. The Guru must enlighten the disciple. Does that mean he must already be enlightened? The guru must have some significant realization of Krishna bhakti – at least a lot more than the new disciple. Obviously, the more advanced, the better. Practically, a reliable guru should at least be well situated in niṣṭhā-bhajan (past anartha-nivṛtti). This may not sound glamorously advanced, but in truth it is a lot more advanced that 90% of the devotees you meet anywhere. Can the guru take a disciple to a realization higher than what he himself has? If the disciple is extraordinary. Ordinarily, though, a guru would place the disciple in the care of a more advanced guru when the disciple requires it. Is it possible that a disciple would have more knowledge of the shastra or more devotion than the spiritual master? How? Isn’t it the spiritual master who gives knowledge of shastra and plants the seed of devotion? The guru-parampara hopes for this. The guru hopes for disciples who can eventually take what they have been given and develop it even further. Otherwise the paramparā only degrades over time. But the enlightened disciple never makes the mistake of thinking he or she is better than guru. Even if our accomplishments blossom more remarkably than our gurus’, it is only because of guru’s grace. A flower cannot grow without seed, sun, water, and earth. Mahaprabhu, Viśvanātha and Bhaktivinode are three examples of disciples whose accomplishments far outshone those of their gurus. What if the guru has relative flaws or makes simple mistakes? The flaws and mistakes of a guru that are not directly related to his or her practice and realization of bhakti are irrelevant. Ex: spelling errors, inability to speak Swahili, no knowledge of advanced calculus, etc. How can a prospective disciple test a prospective guru, since the prospective disciple has little knowledge of śāstra? It is by Krishna’s mercy, not by our examinations, that we encounter our first genuine guru. That first pradārśaka guru gives us some genuine initial education that points us towards a source of valid śikṣā. From this source, śikṣā guru develop our knowledge of śāstra much further. Then we become capable of identifing qualified gurus and distinguishing siddhānta from apasiddhānta. What is the “mercy” of Guru? The mercy of guru is his or her kīrtan and kathā, for that is the vehicle that plants and waters the seed of bhakti in the soil of our hearts. How do we attain this mercy? By earnestly requesting it, evoking it, and then absorbing it. Humility is the first symptom of knowledge, so if a guru really has knowledge why would he ever accept a superior post, like being a guru? We serve according to the needs of the people we are serving. Service is not always executed from an inferior position. I am the servant of my children, for example. To those with more śraddha, we serve by hearing. To those with less, we serve by speaking. To those with similar, we serve by discussing. On the service it may seem that hearing is humble and speaking is proud – but if the person you are trying to serve needs to hear and wants to hear what you have to say, then speaking is not proud, it is dutiful, and therefore humble. Thus, the position of guru is not intrinsically a proud position. Sometimes guru is considered a confidential associate of Srimati Radharani. Sometimes he is considered a representation of Nityānada, Balarama, or Krishna himself. How can we understand this? Guru is the channel for the flow of Krishna’ kṛpā-śakti and kṛpā-śakti flows from different sources, for different purposes. – Hlādinī-śakti flows from Rādhārānī and allows the jīva to be an instrument for spiritual bliss (prayojana). All three entities function through the guru-channel. Sometimes they are described as their manifestations in Gaura-līlā: Nitai, Mahaprabhu, and Gadādhara. CC 1.1.47 purport says dīkṣā-guru gives sambandha, and that sikṣa-guru gives abhideya. What does this mean? How should we glorify guru? Unreservedly, or realistically? Do we declare / request discipleship of a śikṣa guru? It’s a very good idea to disclose and request confirmation from the śikṣā guru, but it’s not an absolute requirement. Who cares. Bhakti yoga not a popularity contest. What do you think about gurus having large numbers of disciples? But, it is a practice of Sādhana listed in BRS to avoid trying to become a “big guru” with lots of disciples, tons of buildings and resources, and impressive arrays of knowledge. This is because having lots of disciples easily makes one proud, and has difficult practical ramifications because it consumes so much time and energy. So – there is nothing “wrong” with having many disciples, but it’s generally better to have only a few. Should there be more dīkṣā gurus in ISKCON? Probably not. In most institutions and saṅgas there is only one dīkṣā guru at a time. Instead of increasing the number of dīkṣā gurus, it would be far better to recognize the greater importance of śikṣā gurus. What if one’s appreciation for the guru wanes? Discuss it openly with the guru. 1. If you wish to officially leave the community you were accepted into and be officially accepted into another. 2. If the person who gave initiation develops a real, spiritual flaw, and thus ceases to represent the community he or she officially inducted you into. Some say the second case is not mandatory, but it certainly seems a bad idea to ignore it. If you receive a degree from a university, for example, and the university is later discredited by the government, it doesn’t change what you have learned, but you would still probably want to follow whatever steps necessary to ensure that your diploma is accredited. Similarly, if your dīkṣā guru fails, it seems a really good idea to accept a valid dīkṣā guru again. In ISKCON, gurus play a managerial role. This seems based on Śrīla Prabhupada’s personal example. Is it wrong? Śrīla Prabhupāda was a guru and a founder of a completely new institution. Therefore he had two roles: one as a guru, the other as an overseer of management. A guru is a guru, and a manager is a manager. In unusual circumstances it is possible for one person to be both, as in Śrīla Prabhupāda’s case. But it is not the norm in Vedic culture, which separates managerial and philosophical roles to kṣatrīya and brāhmaṇa, respectively. Should the GBC be a collective guru? No. They should manage the practical affairs of the society – seeing that the society has money and can provide adequate shelter, clothing, food & medicine for its members. They shouldn’t manage the gurus (inc. brahmins and sanyassis). Guru’s should govern themselves, and focus on educating the society. Is it true that service to guru is everything, and there is little need to hear about Krishna? This is Kartabhājā-apasiddhānta. Unfortunately it is very pervasive and common. Kartābhāja is the idea that guru is everything and there is little or no need for Krishna. This is false. The truth is that guru is the transparent via-media to Krishna, therefore Krishna is everything and the guru makes that plain and accessible. What does loyalty to guru mean? Dedication to comprehending what s/he teaches. How should I approach other gurus & previous gurus? If there is a serious difference between your guru and his gurus, there is something wrong. Either something is wrong with your guru, or something is wrong with your ability to comprehend. Similarly, there is something wrong if there is a serious difference between one of your gurus and another. If something is wrong, like if diska and siksa guru seem to have contradicting instructions, how do I resolve it? Discuss it openly with your gurus. Should the disciple consider every siska guru in his life as a manifestation of his diksa guru? Not exactly – He should consider every guru as a manifestation of Krishna-kṛpā. Must the dīkṣā guru recommend the śikṣā guru? It is the other way around, but eventually goes both ways. 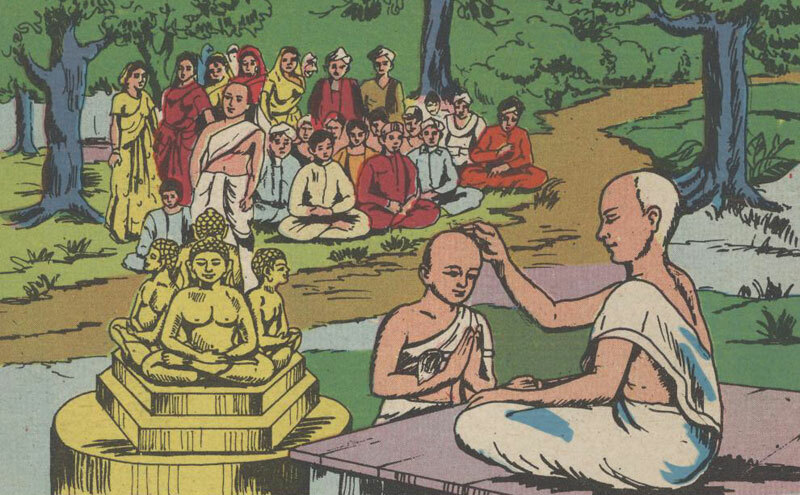 The dīkṣā guru emerges naturally from the śikṣā guru, or by their recommendation. Later the dīkṣā guru may also recommend specific śikṣā gurus. If the siksha guru won’t give diksa, what should we do? Ask the sikhsa guru what to do. Is it OK to feel that ones śikṣā guru is more important than one’s dīkṣā-guru? It is natural that, as time goes on, different subjects become relevant, and thus different teachers become more or less important. Naturally, Krishna’s kṛpā śakti sometimes flows more strongly through one channel, and sometimes through another. But, always remember that all the gurus are different outlets for the same flow of electricity (krishna-kṛpā-śakti). If I have many gurus, who do I pray to during guru-pūjā, for example? How does one awaken bhava and prema for their Guru? We don’t. Bhāva and prema-bhakti are solely for Śrī Krishna. This is the verdict of Śrī Rūpa Goswāmī. The relationship to the guru is seva-bhāva, a relationship of joint service to Krishna, initially with the disciple in an apprentice role. There is a verse in BRS describing how we are related to other devotees at the stage of prema. Śrī Rūpa calls it bhāva-ullasa-rati – affection for other devotees who inspire our own bhāva of Krishna prema. In all cases the prema is for Krishna, and the affection for Krishna’s devotees augments our prema for Krishna. Who will eventually give me prema? Am I necessarily going to be in the same rasa as my guru? Gauḍīya gurus realize the highest conception of Vraja-rasa… adi-rasa. Adi-rasa contains all five sthayi-bhavas. Thus any fully realized gauḍīya guru can nourish any disciple with any rasa aspiration. Often a guru will manifest a clear preference for a specific sthayi-bhava, and this will naturally attract disciples desiring the same sthayi-bhava. It is a natural dynamic, not the outcome of a xerox effect. The xerox effect idea – that guru creates and bestows your relationship with Krishna – is popular in sahajīya apasiddhānta. It is an incomplete version of the gauḍīya siddhānta. Guru gives seed and guides the cultivation. Disciple is the field/soil and performs the cultivation. The relationship with Krishna the result of a combination of efforts from both parties – it’s not a carbon copy handed out by a guru. Is my guru also my guru in the spiritual world? Guru is Krishna’s shakti, snf Krishna’s shakti is the entire spiritual world, so, in this sense the spiritual world is entirely guru. In Krishna-līlā you may recognize one specific shakti as the same exact shakti that came through your guru, and much of the role you play in Rādhā Krishna līlā may be conducted with or through that śakti. Next Guru Takes Your Karma??? Hare krsna vraja, regarding re initiation, I liked your explanation and reasoning as to why one may re take diksa. I have often heard the idea that reinitiation is not sastric. Do you know any example in sastra of someone taking re initiation? I have two questions, if you do not mind..
Q. The Guru must enlighten the disciple. Does that mean he must already be enlightened? A. The guru must have some significant realization of Krishna bhakti – at least a lot more than the new disciple. I am very sorry to submit that this does not seem to be a very safe or proper answer to guide someone to what Srila Prabhupada has taught as he has unambiguously stated in the last part of his purport to Text 5 of the Nectar of Instruction. The first and last sentences in the below extract are very telling. And given the fact that this book is written by Srila Rupa Goswami, the leading Acarya through whom Lord Caitanya specifically established his mission through Books, and given the fact that in the Introduction to this little book (the NOI, link below) Srila Prabhupada explicitly states that ‘this book is for neophytes in Krishna Consciousness’, I humbly submit that we should all study it repeatedly very well, we should guide all new-comers to take full shelter of this book, as it is, without amendment or change, and let Sri Paramatma guide the sincere soul from within. Otherwise it appears that managerial convenience and hosts of other considerations (which are conspicuously absent from Srila Prabhupada’s writings as we all have faith he was not a conditioned soul) may colour whatever we speak with our own level of consciousness.. Therefore I humbly quote this relevant passage for all seekers of pure bhakti to follow in the footsteps of HDG Srila Prabhupada. And by so doing, the reality is Guru finds us, for each person’s guru is directly a part of his own Lord Paramatma. No innstitutional rules and guidelines are relevant to the ultimate Guru Tattva. Indeed, the advanced uttama-adhikārī Vaiṣṇava devotee should be accepted as a spiritual master. Everything one possesses should be offered to him, for it is enjoined that one should deliver whatever he has to the spiritual master. The brahmacārī in particular is supposed to beg alms from others and offer them to the spiritual master. However, one should not imitate the behavior of an advanced devotee or mahā-bhāgavata without being self-realized, for by such imitation one will eventually become degraded. This reconfirms the importance of the writings of Srila Rupa Goswamipad, after whom, our Acaryas have been glorified with the title ‘Rupa-anuga’, meaning One Who Follows Strictly in the path laid down by Srila Rupa Goswami. Therefore, I believe the above quoted passage is quintessential in guiding any sincere potential follower of our beloved Srila Prabhupada. Please forgive me if my comment or way of expressing it has hurt or offended anyone. That is not my intention. I am a conditioned soul, and I merely want to share the most relevant, authoritative quotation that came to my mind, for surely no one can guide beginners better than Srila Rupa Goswamipad, as he has incarnated in the form of the books by Srila Prabhupaada, preeminently so in the Nectar of Instruction and the Nectar of Devotion. Hare Krishna! This is a personal blog, I am the only author of the posts. Uttama adhikari is defined in Bhakti Rasamrita Sindhu, and is often confused with uttama Bhāgavata defined in Śrīmad Bhāgavatam. And uttama adhikari has the characteristics of clearly understanding the śāstra, being convinced of its validity, and having the ability to explain it very clearly to different people in different situations. Such a person is clearly the best guide / guru. The more advanced the better, but at the very least we need such an uttama adhikari who has deeper realization than we do. The deeper the better.